And right on time, JPMorgan defends the firm, saying "buy on weakness." This is the biggest drop since March - for the company that was up 93% year-to-date before today. As Bloomberg notes, Twitter rose 6.8% last week, coinciding with a positive note from Wells Fargo analyst Peter Stabler, touting the company’s success with video content and improved monetization efficiency. The social platform’s "high valuation is expecting continued momentum in user growth and engagement that they have seen over the past several quarters," Waral said. But now, the "volume of fake account deletion, albeit good for longer term, raises uncertainty on near-term user growth expectations," wrote Bloomberg Intelligence analyst Jitendra Waral. 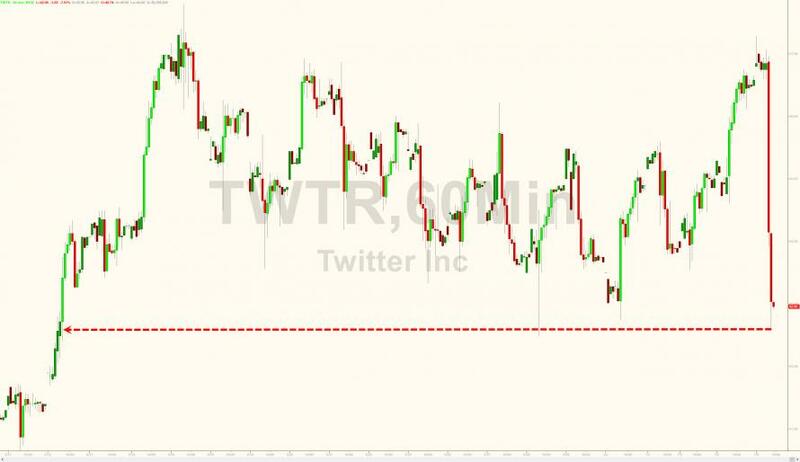 But Twitter's stock is still up 83 percent year-to-date, and Waray believes the "risk to daily user growth should be low as the company has underscored low activity on the deleted accounts."